Home »Posts Tagged "Hotel Reviews"
All the hurly-bury around online travel industry reviewing Revenues, Traveler Activities, Social Media influence, Mobile Phone usage and more. It’s the Hotels final sprint. 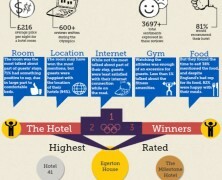 How did they score in 5 major visitor experience criteria during the London Olympiad? A survey based on 600+ reviews and 3697+ raised sentiments.